One of the many many MANY reasons that I love New York City is that you can dress up head to toe and have a photo shoot in the middle of the street and no one even blinks an eye. I got a few stares but none compared to the ones that I get in Denver. It’s like “Have you never seen anyone take a photo before?” Geez. It’s totally the norm in NYC to vlog and take pictures. I felt completely fine whipping out my camera and talking to myself. I was also “in the zone” when taking blog pictures, I wasn’t uncomfortable at all. I felt totally myself and accepted. That’s what New York is all about isn’t it? Ugh. I cannot wait for the day that I call NYC my home. I LOVE NY too!! ❤ this whole look is perfection! If you read my Autumn Wishlist you will know that I’ve wanted this for a while and as it was only like £4 I bought it. Although I’d read raving reviews, I really wasn’t expecting much so I was pleasantly suprised when it ended up being really good. It is quite dark so requires either a lot of blending for paler skin or a darker skin tone. The highlighter is quite good and I use it a lot more than any other sculpting product because it’s easy just to put it under the arch of my eyebrows when only wearing eye/brow makeup. Overall the collection product is really good value for money and I think it will last a long time! It currently costs £2.79 at Superdrug as it’s on sale. I know I said before, the Hoola bronzer was my favourite but I change my mind; the sephora contour trio is definitely it. It’s got three parts- blush, highlighter and bronzer. They’re all quite shimmery but compared to the NYC one, the bronzer is quite matte. I am so embarrassed, how I wish you could delete comments very sorry! I LOVE that jumpsuit! 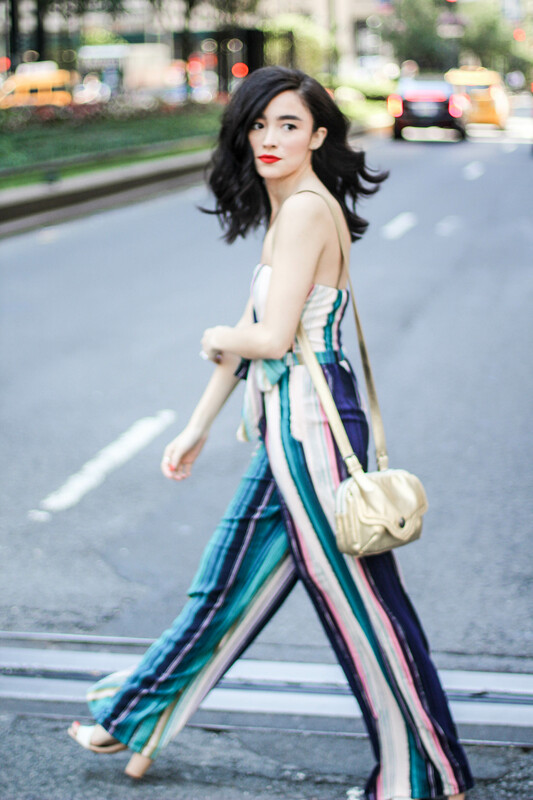 Everything about it is perfection–those colors, those stripes, that little tie on the side! That jumpsuit is amazing. Love it!